Phuket, pearl of the Andaman sea, is an exotic paradise amidst the idyllic natural setting with warm sparkling sea. There are unspoilt sandy beaches, blue lagoons and breathtaking lush green tropical scenery. 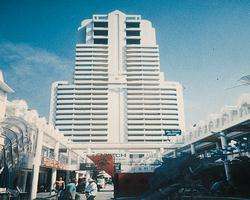 Patong Tower Condominium is the highest building in Phuket. It is also close to Patong Beach. Located on prime location, right in the heart of the golden Patong beach, banks restaurants, entertainment and shopping areas are all nearby. The resort offers arranged tours, please check with the reception.